He danced, he dozed, he prayed, he gave a double middle-finger salute to spectators and then, when it was all over, he was helped out of his chair and out of the stadium. 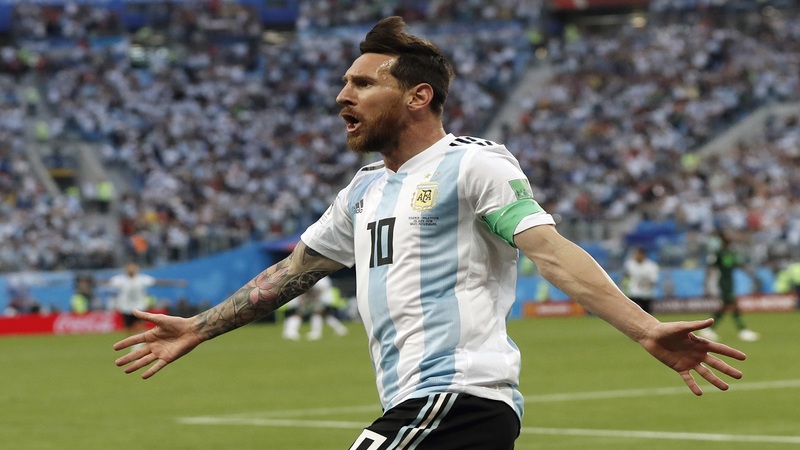 Maradona's performance in the stands was as eye-catching as the one produced on the field by Lionel Messi in Argentina's 2-1 win over Nigeria, which spared the South American nation an early elimination from the World Cup. 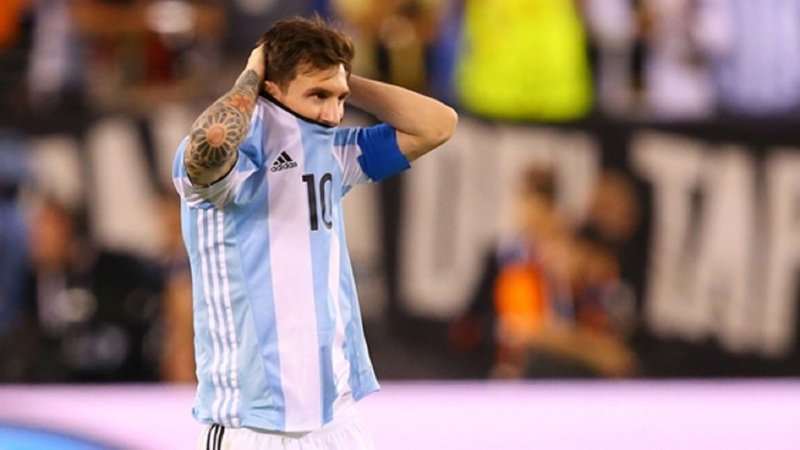 Maradona might be Argentina's No. 1 fan at the World Cup, but he's also proving to be an unwanted — and sometimes embarrassing — distraction, increasingly casting a shadow over a team trying to win soccer's biggest prize. "Maradona is in danger of becoming a laughingstock, I'm afraid," former England striker Gary Lineker said during post-game analysis on British TV. 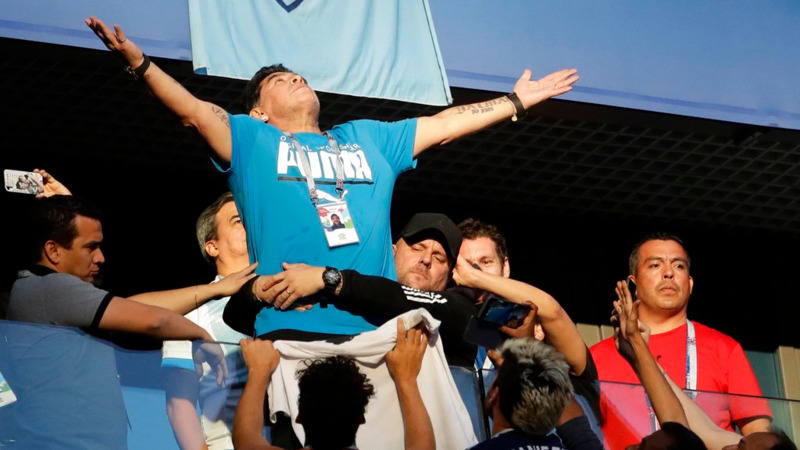 The good news is that, according to Maradona himself, he is OK after his wild night inside St. Petersburg Stadium, during which he required medical treatment and was pictured with his eyes closed for parts of the game. Before kickoff, footage showed him dancing with a Nigeria fan in the area in front of his executive box. "I want to tell everyone that I am fine, that I am not, neither was I interned," the 57-year-old Maradona wrote on Instagram alongside a picture of himself with medical staff. 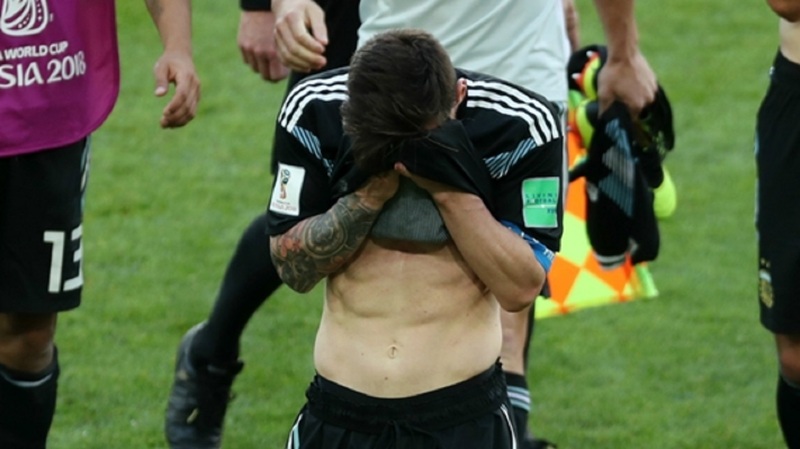 "In the halftime of the game against Nigeria, my neck hurt a lot," he added. "I was checked by a doctor and he recommended me to go home before the second half." But he didn't. He stayed on to see Argentina score an 86th-minute winner by Marcos Rojo, and celebrated by aggressively giving a middle-finger salute with both hands toward spectators below him. "I wanted to stay because we were risking it all," Maradona wrote. "How could I leave?" Soon after the final whistle, he needed help getting out of the stands and into an adjoining luxury box. Hours later, he was photographed smiling at an airport. Another photo posted on Twitter by a Colombian television journalist showed him sitting on a plane reportedly heading for Moscow. Maradona's antics raised more concerns over the health of one of the sport's most iconic players, who led Argentina to the World Cup title in 1986 — scoring the famous "Hand of God" goal along the way — and later coached the national side at the 2010 World Cup. He is worshipped in his home country, where is known as the "Pibe de Oro" ("Golden Boy"), and by soccer fans throughout the world. But he has battled cocaine use and obesity, which affected him at the end of an illustrious playing career that finished in 1997. Hospitalized in 2000 and again in '04 for heart problems blamed on cocaine, Maradona was treated at a hospital again in 2007 for acute hepatitis that his doctor blamed on excessive drinking and eating. At this World Cup, it seems there are as many cameras trained on Maradona during matches as there are on Argentina's players. He stood with his arms outstretched and looked to the sky at one point during the game against Argentina. Below him were spectators with their smartphones out, eager to catch a glimpse of a soccer great who, to some, is damaging his reputation. "The people in Argentina laugh at him at the moment. We feel sad," said Oscar Cicchilli, a 68-year-old Argentina fan from Buenos Aires who was in St. Petersburg for the Argentina-Nigeria game. "He has a difficult personality. He has problems." No other figure or former player is overshadowing their national team like Maradona is with Argentina at the World Cup. Then again, few have the emotional mood swings, box-office temperament and back story that Maradona has. Cicchilli doesn't think Maradona's antics are affecting the team in Russia. Maradona isn't currently linked to the Argentine FA, so no members of the federation were willing to comment about him following Tuesday's game. FIFA was keeping quiet, too. Maradona is an official ambassador for the world's governing body but was not on the official list of FIFA guests for the Nigeria game. He attended Argentina's game against Iceland at the start of the group stage and sat in a VIP section as part of a group of former players branded as "FIFA Legends." He was criticized by some for an apparent racist gesture toward an Asian fan during that game, though Maradona denied it , and also apologized for smoking a cigar in the stadium, despite that being banned by FIFA. FIFA banned Colombia's Edwin Cardona for five friendly matches for a similar gesture in a game against South Korea. And England's Dele Alli was suspended for one match after he raised his middle finger during a World Cup qualifier. But so far Maradona has escaped discipline. The world now awaits the next installment of the Maradona story, at Argentina's round-of-16 match against France in Kazan on Saturday.